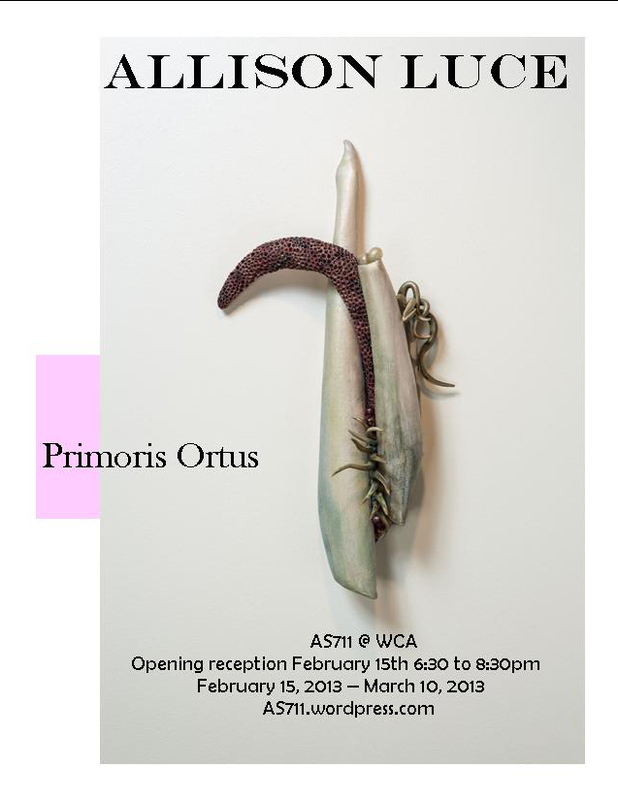 Women Centered Art (WCA) is pleased to announce Primoris Ortus, a solo exhibition by Allison Luce. Working primarily in ceramics, Allison Luce‘s work is based upon the notion of the human body being a shelter for the soul. “Primoris Ortus” explores concerns about fragility and femininity and its relation to the concept of eternity. The idea for this body of work comes from the story of the Garden of Eden and explores issues regarding the frailty of the body and the fallibility of man. Referencing nature as well as the body, these sculptures are about growth, temptation and the passage from innocence to experience. Allison Luce graduated with dual BFA degrees in Painting and Art History from Ohio University and her MFA from Hunter College, City University of New York. She currently lives and works in Charlotte, North Carolina where she is a studio artist and an adjunct art instructor. She has shown her work in solo and group exhibitions and her work is included in private collections.